You may have heard of All-on-Four dental implants if you have been exploring your teeth replacement options. This technique was created by Dr. Palo Malo, a Portuguese dentist, as a way to place a full arch of teeth on individuals with low bone density. At the same time, this treatment avoids expensive bone grafting. If you do not have a lot of bone remaining, this treatment may be a possibility for you to consider. Highly angled implants are surgically implanted near the front of the jaw. The placement is angled so that the denture can still be secured even with minimal bone at the site. You can see this technique illustrated in the diagram. For patients that are missing a lot of bone, this technique can be appealing for many reasons. Time-consuming and expensive bone grafting surgery is completely eliminated, and the patient can have the entire treatment done in only one appointment. Some clinics that advertise heavily base their appeal on the simplicity of this treatment for the patient. They choose to put All-on-Four implants on every patient with compromised dentition. However, Dr. Coleman doesn’t believe in a one-size-fits-all solution in dental implants treatment. Every case is different. Although he believes the All-on-Four technique is appropriate for some patients, he is far more concerned about the long-term results and quality of life of each and every one of his patients. And while you need to make the final decision about which treatment option you want, he wants you to be fully informed of the benefits and risks of each treatment. Some feel that All-on-Four is a shortcut because it has a much higher risk for failure. In many cases, bone grafting would bring a more stable and longer-term result. Also, if all the implants are placed in the front of the jaw, which is usually the case with All-on-Four, there will still be bone resorption in the back of the jaw. The immediate area around the dental implants will not be resorbed because the bone is stimulated. But the posterior section of the jaw is still subject to bone atrophy. To learn more about this process, please visit our facial collapse page. To compensate for a lack of volume of bone in supporting the implants, the four implants are placed at extreme angles, as shown in the radiograph above. This makes them very resistant to loosening, and is what gives the denture that is attached to the implants its stability. However, if one of the implants fails at some later time, the entire case will fail and will have to be re-done. All of these risks need to be weighed against the advantages. All-on-Four is definitely easier, faster, and less expensive than other options. For more information about other risks involved with dental implants, please visit our dental implant failure page. Dr. Coleman will present all of your options and will discuss the advantages and disadvantages associated with each procedure. 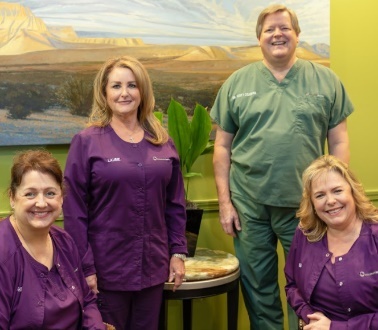 Call 713-783-2800 to schedule an implant consultation where Dr. Coleman will help you determine if you are an All-on-Four candidate. He will be honest with you and make every effort to give you a better idea of what the best options are for your specific case.